Hideki Motosuwa is cramming hard for his upcoming exams, desperate to be accepted into university and to make something of himself. His other singular obsession is the attainment of a persocom, a humanoid robot far out of his price range. Gradually Hideki and Chi form a unique bond, though the young man is at a loss as to where the doll came from or why she has no memory. He slowly teaches her to talk and interact with other people, though as in the manga series upon which the anime is based Chi’s efforts often have unintentionally comic results. Hideki also discovers along the way that Chi is apparently a chobit, a legendary form of persocom capable of emotion and free will. The manga’s original 8 episodes have been spun out into no less than 24 for the anime adaptation, and are here collected over 3 discs with a total running time of over 11 hours. 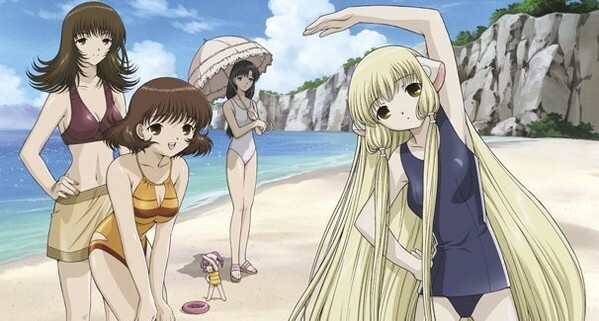 Given the fact that even over the modest length of the manga the storyline tended to lag a little, the anime’s writers have occasionally had to depart from the source material in search of ways to flesh out the story which is often quite literally accomplished by the addition of plenty of fan service, as when Chi goes lingerie shopping or inadvertently gets a job working as an underwear clad cam-girl. It’s all quite lighthearted and tongue in cheek however, and the series features a strong emphasis on humour which is played out to excellent effect. There’s also plenty of depth too, and as the story develops Chi becomes increasingly obsessed with the unique relationship between persocoms and humans, as embodied in the existentialist A City With No People books she discovers while out shopping one day. The mystery of her creation is also unravelled, and a kind of shadow identity also emerges in the form of Chi’s sibling Friya, who is able to unlock several other secrets of her past, and the reason for her existence. 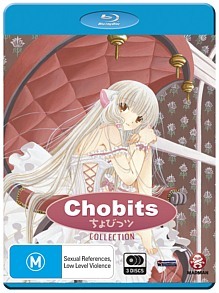 Chobits is a fascinating dissection of the relationships between human beings and technology, and an intelligent alternate-reality musing on exactly where that technology might take us emotionally and physically in another century or two. The animated adaptation is visually stunning, with luminous, painterly backgrounds and beautiful character designs that bring the source material to life in every conceivable sense. It also builds to a satisfying, meaningful conclusion that more than rewards investment in the full series, and explores a number of important moral and philosophical considerations inherent in the notion of people and artificial intelligences coexisting as potential equals. This is quite an exciting local release for anime fans that has been dealt with in typically adroit fashion by Madman. In addition to looking magnificent on BD, with a vibrant 1080p upscaled transfer making this 2002 series look as fresh as a daisy, the series also features two robust TrueHD 2.0 audio tracks and some absolutely first-rate acting on the Japanese mix, with Chi, Hideki and the principal supporting characters having been expertly cast (the English dub is no slouch either, for those that prefer their anime with an American accent). There’s plenty of clarity, a solid midrange and some nice separation. The dialogue and music are also clear and consistent; there are no defects to speak of whatsoever in an audiovisual sense. The local release features over 90 minutes of supplementary material, most of which is presented in high-definition. There are several additional OVA episodes, previews, textless openings and closings and a handful of trailers.